Unsurprisingly, this square is dominated by images of the renowned Hook Norton Brewery. Founded in around 1850, it is still run by descendants of the original brewer. Although its reputation is based on its excellent variety of traditional ales, the fabric of the brewery is equally deserving of study. 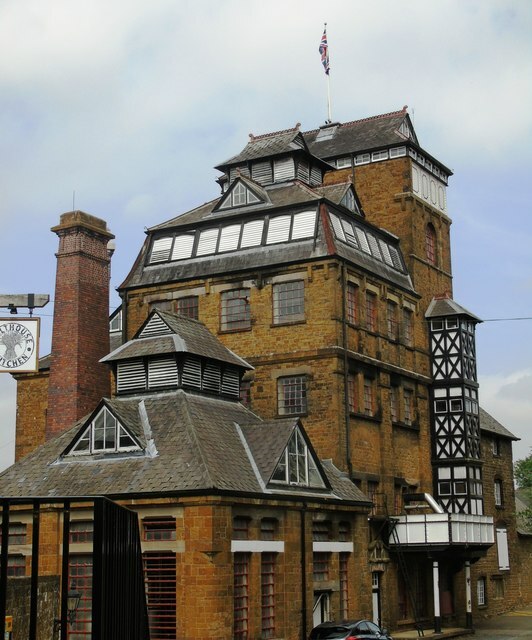 Principally, the external appearance retains the profile of a traditional tower brewery of the late 19th century. This developed around the traditional methods of brewing ales, with transition between different parts of the process being carried out by gravity. The retention of traditional methods means that an old building is fundamentally no hindrance to an efficient business, although as it is now listed grade II, the scope for structural alterations is limited. Also listed are a number of the ancillary buildings, so the whole site retains a traditional feel. which crushes the malt ready for creating the wort.